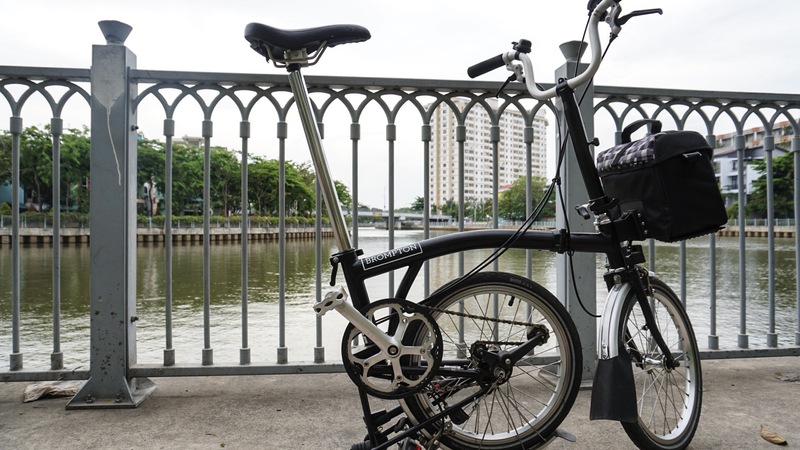 Bike travel with Brompton in Saigon – Vincita Co., Ltd. I recently caught an Asia travel fever. 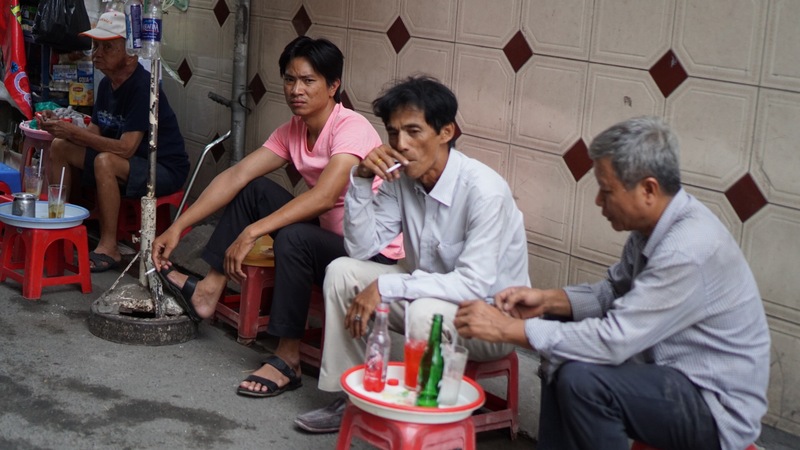 I’ve heard so many good things about Vietnam that I couldn’t miss out on it. Culture shock, cheap food & impressive scenery : let’s do it ! It was also the first time I brought my Brompton folding bike along. 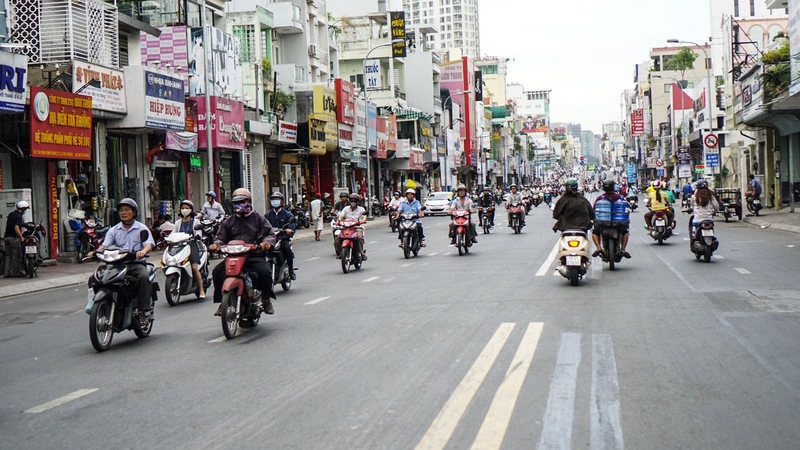 Here’s an overview of 7 days in Ho Chi Minh City, or as I prefer to call it, Saigon. This is confusing because as I’m writing, I’m already on the way back to Belgium (I guess I was too lazy for this during the trip). I wanted to angle the post on the exploration through folding bike, as I really struggled to find any existing information about this when preparing for my trip. I arrived in Saigon on a Sunday late afternoon. 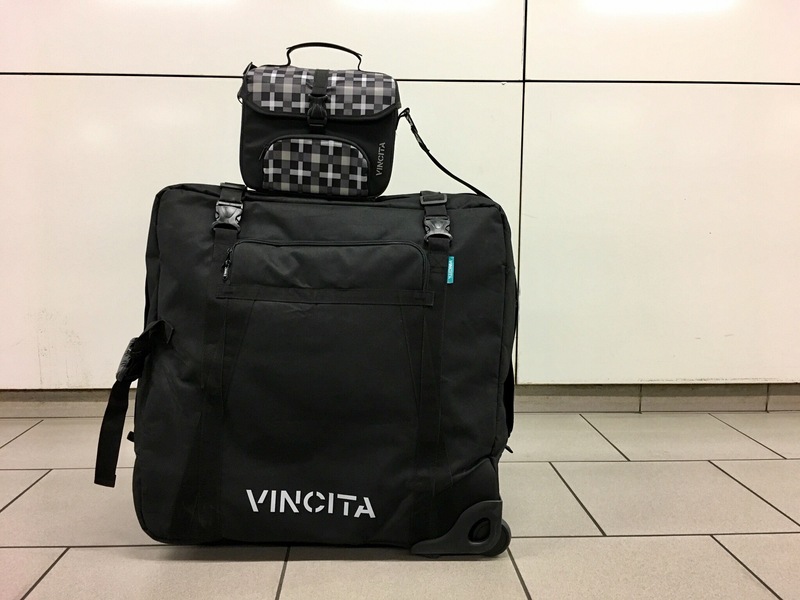 The most efficient way to carry my bike and belongings in one piece is definitely the Sightseer by Vincita. The Bangkok based brand makes sturdy, well designed bags which are also less expensive than the Brompton ones. The bag is lightweight (about 2,5 kg) and uses your clothes in an additional garment bag to protect the bike. As it is, after all, a bag with soft padding (not a hard case), I made sure to remove the plastic hinges and protect the edgy sides of the bike (you never know how your luggage is handled, especially with multiple flights). After I picked up my luggage and became a millionaire in Vietnamese dongs, I took a cab and arrived safely to my Airbnb. (We’ll get back on the convenience of shared transports in Saigon later).Thankfully, I already had my friend Nhi Nhi to share a noodle soup and a coffee with in the heart of Saigon. The next day, I started my solo exploration with the Brompton. I woke up early, and it already felt like 30 degrees. I was cruising by the riverside, in the small streets with open air markets or randomly stopped to get an iced coffee. The folding/unfolding mechanism of the bike always gets the curiosity of locals, especially middle aged men. They kept asking me about the value of the bike, which I said it was a gift and handmade in the UK. In the first place, I thought the bike would be a dead weight, and that I’d only use it outside of the city once or twice because of the insane traffic. I was completely wrong. The fact that you mostly have scooters that ride slowly makes it a great city to bike once you get used to it. Don’t forget your sunscreen, your mask and just go with the flow and the honking symphony ! One great thing you can do with a Brompton in Saigon is to combine bike and taxi. You simply order a cab (such as Uber or Grab) and put your bike in the trunk. It will cost you between 80 cents and 4 euros depending on where and when to go. It is great when you want to explore multiple areas during the day, but don’t feel like biking for too long, especially under 35°. Also, you can spontaneously stop anywhere and take the bike inside with you in the restaurant or cafe. I never had to use my lock or worry about street parking. It’s also an excellent conversation starter. For my solo adventures, I used a small front carrier bag for Brompton by Vincita. It fits the essentials: my camera gear, sunscreen and a bottle of water. It’s a must have for a bike and photography enthusiast. Also, having a backpack under the heat wasn’t an option for me, as I already sweat enough without anything on my back. The Brompton isn’t for every situation though. You don’t take it when meeting up with someone who doesn’t have one or to party at night. 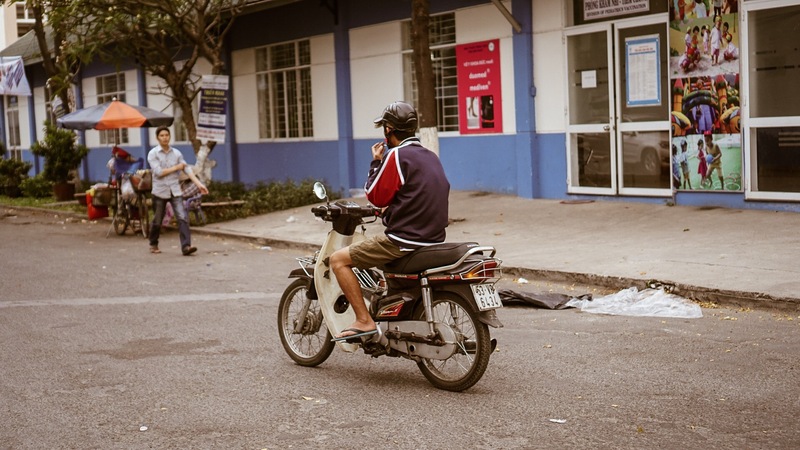 But it instantly gives you a new perspective on a city like Saigon. Having your own multimodal medium of transportation here is extremely enjoyable. Because I found this so enjoyable to explore, I didn’t really bother booking city tours. One time, I spent the day at the back of my friend Allison’s scooter to take photographs in motion (because stopping the Brompton in the middle of the traffic is not an option here). 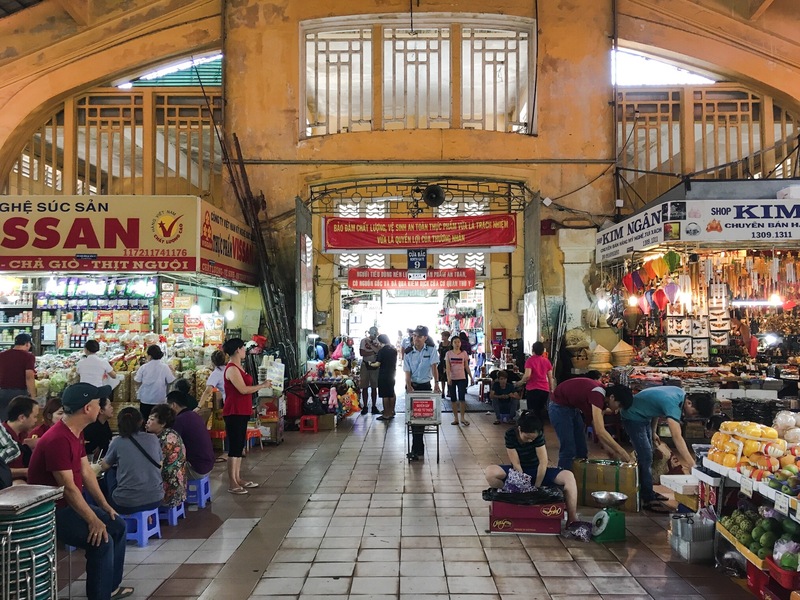 We also went to Bui Vien, the tourist/party area and the indoor market below. Being surrounded by Western backpackers wasn’t the main purpose of the trip, so I stuck to a familiar rooftop and a couple drinks in coffee shops & small bars. Tip: when going to downtown at night, use Grab Bike : about 50 cents the ride and faster than a cab. There was no way I was gonna have any Western food in Saigon. The taste, surprise and price of local food was way too interesting. I got countless Pho, Banh Mi & Saigon beer of course, but also very uncommon things such as banh xeo (a giant pancake you wrap in lettuce), or what looks like a spring roll workshop. 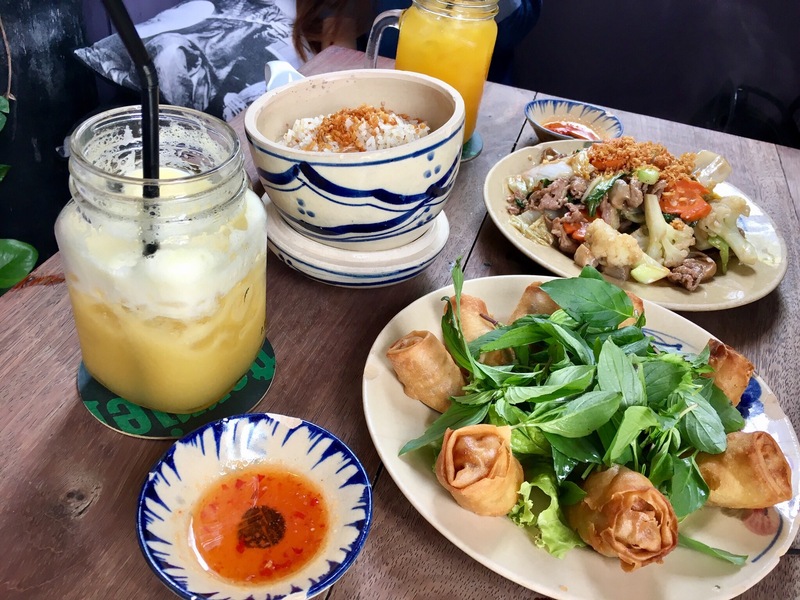 These two last dishes have to be eaten the right way: make sure to ask the staff or bring a local along (even better). Street food carts bring along plastic chairs for you to seat, and big open air restaurants such as the one below are very frequent. They have this giant beer garden atmosphere I like and it never gets cold. Plus it remains cheaper and more local than indoor restaurants. The coffee & juices “scene” is also something big there. I tried homemade juices & brewed teas, sugary “Ca Phe Sua Da”, milkshakes, smoothies and more. You can do this at super cosy coffee houses with an incredible view or just off the street on plastic chairs.We don’t call these food trucks but food bikes or carts here. There are so many that you can get tempted by anything at any time of the day. And you wallet doesn’t have to feel guilty about that portion of mango or coconut milk smoothie you just had. Eating cheap and healthy food out is definitely something we miss in Western Europe. For someone like me who has to cook alone, Vietnamese street food or small restaurants would be a life saver. Cheap & healthy food on the go shouldn’t be expensive or junk food. OFF TO THE BEACH FOR BEATS ! One regret is that I haven’t seen so much outside of Saigon this time. 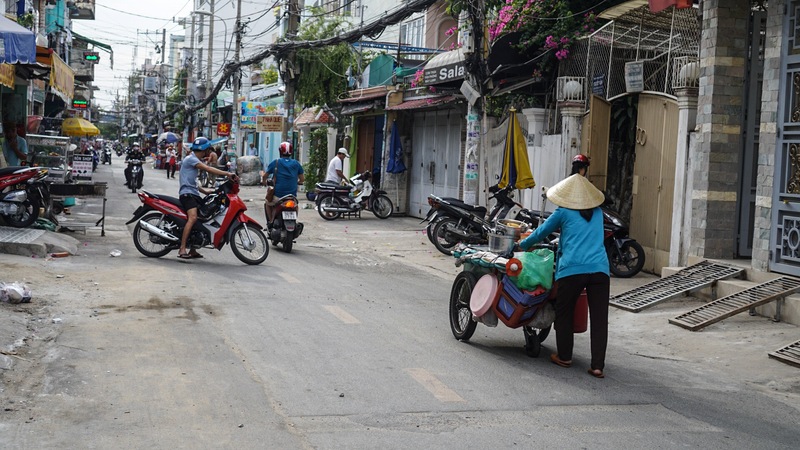 With 5 days in the city (7 in total), you can’t really go see the Mekong Delta or the tunnels. Plus I don’t really enjoy guided tours or museums. I guess it was more a city experience than a nature roadtrip this time, which I really enjoyed. The last two days, we escaped the city and went to a beach music festival. 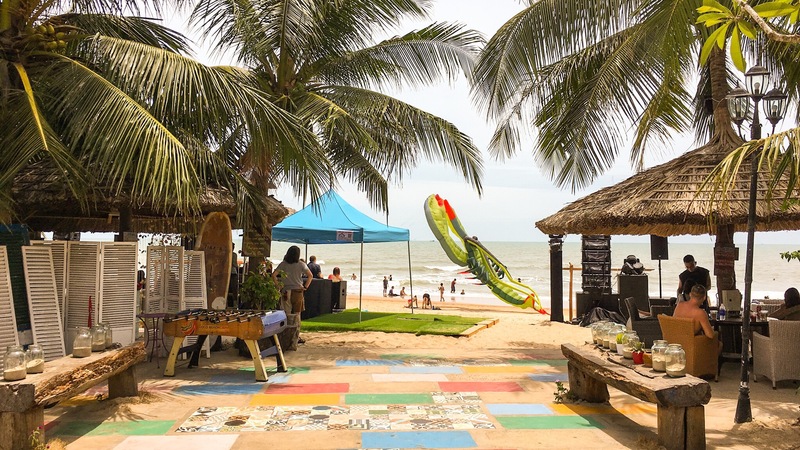 I went there with my friend Allison & her buddies in Coconut Beach Camp, Xa Tan Phuoc (sorry about the accents guys). Put it like this: French expats collectives throw a rave on a beach resort with 3 stages, mixing techno, dub, psytrance and drum & bass. The whole thing until 6 am. Big up to Saigon Dub Station & Indika, as it’s the last thing I would expect to find in Vietnam. 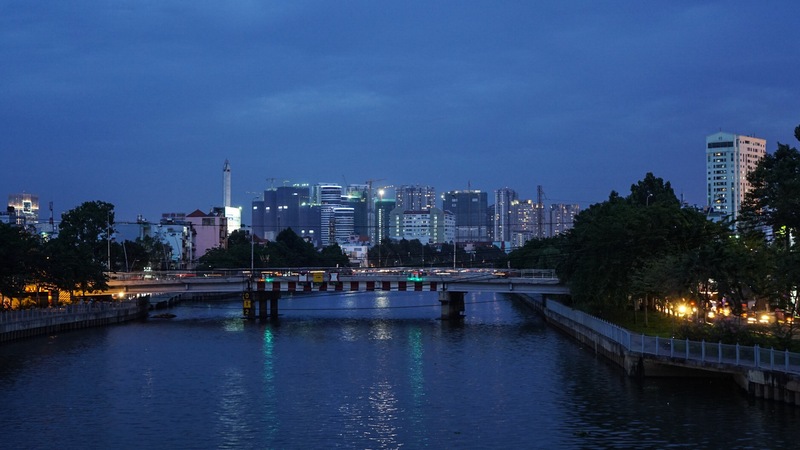 The beautiful Saigon has many things to offer to the tourist or long term resident. Awesome food, friendly people, modern and booming city with a beautiful scenery and an active nightlife. It is definitely one of my top choices for when I’ll be a digital nomad. There is still so much more I haven’t seen in this 12 million people metropolis and its surroundings. Yes, the traffic is insane, it’s hot, there are tourists traps, poverty and it’s not as clean as other countries in East Asia. But I think you can really get used to it. Every city has its few downsides, which would be boring otherwise.